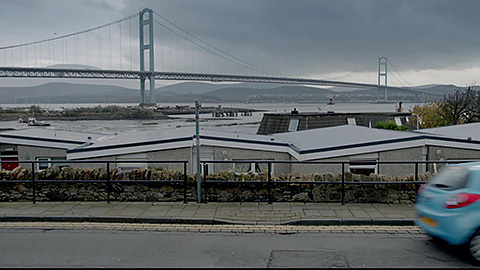 A short scene in episode 2 shows Stewart Gilmour (Christian Cooke) driving along in his rented Ford Ka with a bridge in the backdrop. 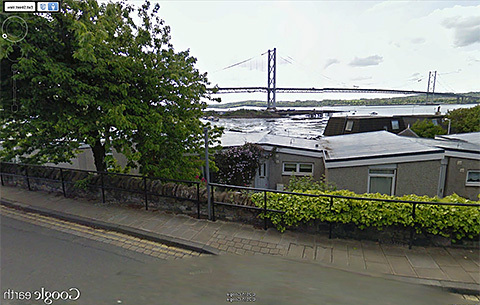 Filmed at Main Road North Queensferry along with a lot of CGI jiggery pokery. As well as the changes to the bridge itself (see below) the image has also been flipped horizontally to reverse the bridge direction and thus fit in with how the bridge would look from Stonemouth. Along with this is a new backdrop to the bridge with some high hills now seen in the distance. Some noticeable changes to the Forth Road Bridge which is the basis for the bridge seen in Stonemouth were rounded tops to the main support towers/columns and the change of the St. Andrew’s Cross shaped bracing between the towers to solid horizontal instead. Image below from Google Earth Street View has been horizontally flipped to match the scene in Stonemouth.